That collective sigh you just heard is the Alabama fanbase preparing for another trip to Nashville to face the Vanderbilt Commodores (KenPom: 131; NET: 115) in Memorial Gymnasium. For those of you new to the party, Alabama has beaten Vandy just twice in the last twenty-eight years in that building. That should help explain why we're stressed despite the Dores entering this game with a record of 9-13 (0-9). Game time on Saturday is 7:30 P.M. CT. SEC Network will televise the game. My Two Cents: After a shaky first half, Alabama handled its business at home vs a rebuilding Georgia team. As DJC mentioned in his recap, it was nice to see the guys take control of a game and simply be the better team. Once again, turnovers and struggles at the free throw line in the closing minutes was concerning, but not enough to seriously threaten the outcome. Now if Alabama can overcome the Memorial nightmare, the team will win consecutive games for the first time since January 5th when the win over Kentucky capped a 5-game streak. Everyone knows about the struggles in Memorial, but if Alabama fans could ever be forgiven for expecting a win there, this is the year. Yes, Vanderbilt lost Darius Garland, arguably its best player, for the season back in November, but this team doesn't have the record it has simply because of that injury. One look at the advanced stats reinforces that opinion. Based on the data at KenPom, Vanderbilt is ranked 11th or worse in the conference in offensive efficiency (14), defensive efficiency (12), effective field goal pct (12), opponent effective field goal pct (14), turnover pct (11), opponent turnover pct (13), offensive rebound pct (14), opponent free throw rate (11), 2-pt fg pct (13), opponent 2-pt fg pct (13), 3-pt pct (11), free throw pct (14), block pct (12) and steal pct (12). Whew. That's a lot of bad, folks. Of course, none of those stats mean anything for one forty-minute game. College basketball is littered with games in which the perceived superior team doesn't play well or the perceived inferior team plays out of its mind. And for all of its poor stats, two of Vandy's nine losses in league play were by one possession, and another loss was an overtime loss to Tennessee, a game that Vanderbilt seemingly had in the bag before a controversial late foul call helped turn the tide for the Vols. It's easy to get lost in the poor numbers for Vandy, but this is still a road game at Memorial and I'm not taking anything for granted. The areas in which Vanderbilt has been solid to good is they are second in the league in free throw rate (but, unfortunately for them, last in the league in free throw pct), limiting opponent offensive rebounds (ranked 6th) and opponent 3-pt pct (7th). Alabama has not been as good on the offensive glass in the last few games so that needs to be an area where they excel on Saturday night. Alabama has also been much better in running efficient offense inside the three point line (tied for 5th in the conference in 2-pt pct), and, remember, Vanderbilt is 13th in the league in defending opponent's 2-pt pct. If Alabama commits to scoring in the paint early and often in this game, we should be happy with Saturday night's result. On the defensive end, our guys have to force Vanderbilt into tough shots. This is already a team struggling on the offensive end; the last thing you want to do is give them easy looks early in the game and let them gain some confidence. Let's keep in mind that this is an 0-9 basketball team in the league, and they've got to be desperate for a win. It's also important for Alabama to defend without fouling. The best thing this Vandy team does is get to the foul line. They struggle to convert once there, but if they're knocking down those shots for a change, it's going to slow the game down, allow Vanderbilt to set their defense, and put Alabama in half-court situations where they can't do what they do best, get out in transition. 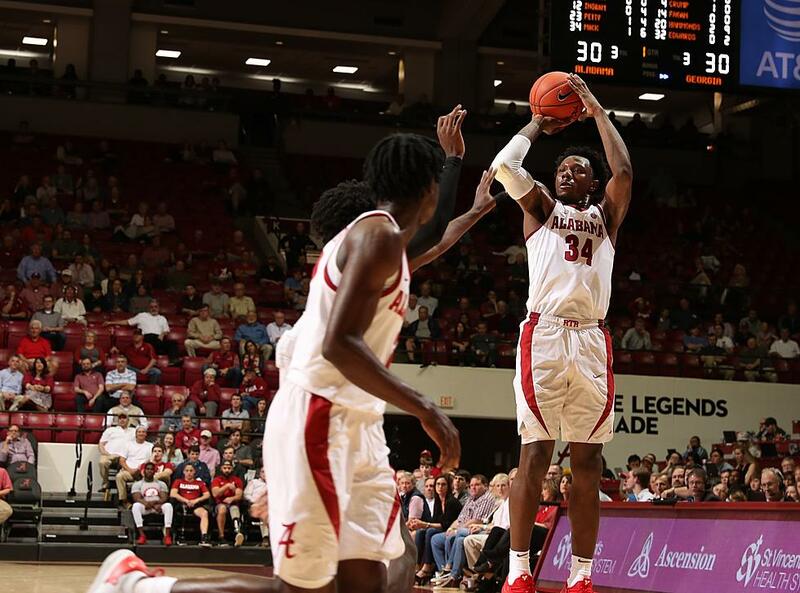 Players to Watch: I thought Wednesday night was Tevin Mack's best individual performance in an Alabama uniform. He finished two shy of his career high in points, and it was certainly his hot shooting that helped open up the game in the second half, but he also had 6 rebounds and 2 assists. Maybe it's my own fault for expecting too much, but I must admit I had been somewhat disappointed in Tevin's season. Wednesday night's performance was great to see, but let's remember that between his outstanding game vs Kentucky and the Georgia game, he averaged 5.8 pts, 3.1 rebs and 0.8 assts. Fortunately, this team is balanced and doesn't need Tevin to have games like Wednesday every night, but I would like to see him have more success in consecutive games. Darius Garland wasn't the only five-star recruit that Vanderbilt signed in the 2018 class. Simisola Shittu was actually three spots (11th) higher than Garland in the 247 national rankings. Despite a tough season overall for Vanderbilt, Shittu hasn't disappointed. The 6'10, 240 lb forward is averaging 12 ppg, 7.1 rpg, and is even adding 2 assists per game. Alabama has been vulnerable at times this season in the paint against teams with talented interior players. If Georgia had more guard talent (and Crean would play to the strength of his team and slow the game down), their trio of big men would have likely been the difference between victory and defeat because they routinely got what they wanted in the paint at times in the game. With that in mind, Shittu could be primed for a big game on Saturday night. Also keep an eye on freshman Aaron Nesmith. If Vandy fans want to grade this season based on the play of their freshman class, this team would likely get a passing grade. Garland was playing high level basketball before his injury, I just told you about Shittu, and Nesmith is also playing well, getting better it seems with each passing week. He's averaging 10.5 pts, 5.5 rebs, and is the team's best 3-point shooter at 37%. Prediction: The curse at Memorial will be much-discussed heading into this game, and with good reason. There have been better Alabama teams that have traveled to Nashville and come home with a loss. Even last season, despite Vanderbilt finishing 13th in the league, Alabama could not find a way to win the game in Memorial, falling 75-76. That said, this Vanderbilt team is projected to finish even worse than last season and its worst season in the last sixteen years. The fact that Vanderbilt is headed for back-to-back very bad seasons also doesn't bode well for Bryce Drew. That certainly adds some desperation for this team in the final five weeks of the season. Alabama has to expect that Vanderbilt will come out swinging in this game, and play accordingly. I won't be shocked if Memorial Magic rears its ugly head again, but I'm going to pick the better team to win.